A Red Dot Concept Design award winner, the Eco Printer looks to extend the life of paper without the need for shredding and recycling. Typically, printer paper can be shredded, re-composited and used five to seven times before its integrity is lost and it must be thrown away, and while this is a significant improvement over the days of printing and then trashing billions of single-sided pages, designer Sharsha Lee has designed a way to do it better. It’s called the Eco Printer, and it works by using photo-sensitive ink to print pages, ink that is then removed by UV radiation when the sheet is then re-printed, greatly prolonging the lifespan of the paper products we love and use – in spite of supposed increases to digital business options. Eco Printer: UV light does us some good. The Eco Printer is simple and straightforward, but does have a few limitations. First, only sheets printed by the Eco Printer itself will be re-usable – other printers will not use the same type of light-sensitive ink – and the pages will still degrade over time as images begin to bleed through and the paper loses its consistency with multiple handlings. Though UV ink itself has a number of excellent properties – most notably its lack of volatile organic compounds, it is also subject to fading under direct sunlight, no surprise given the amount of UV rays that come from our nearest star. 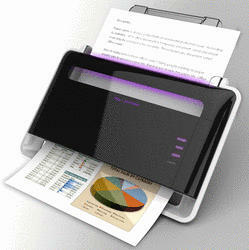 For an indoor, office and repeatable use, the Eco Printer is a great idea, and could help to greatly reduce the amount of paper waste that business generate, so long as they are willing to handle their documents with care and create a system whereby they are re-used without any important information being lost. Sounds ultra viable to us.